When most people with diabetes think about the effects that different foods have on their blood glucose levels, one particular component of foods usually comes to mind: carbohydrates. And rightfully so, since out of the three major macronutrients in the human diet — carbohydrates, proteins, and fats — carbohydrates have the greatest effect on blood glucose levels. 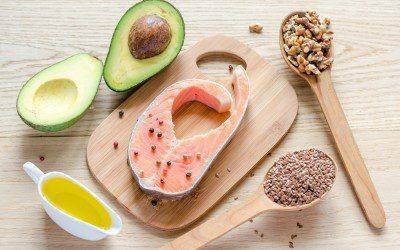 But as a recent study makes clear, fats can also have a significant effect on blood glucose levels — both positive and negative. As many people with diabetes have experienced firsthand, eating fats in combination with carbohydrates can affect how quickly the carbohydrates are absorbed in the digestive tract, potentially leading to a slower, more sustained rise in blood glucose levels. But this study looked at a different, often overlooked aspect of dietary fat: what type it is — saturated, monounsaturated, or polyunsaturated — as well as the effect of substituting fat for carbohydrate. Published last month in the journal PLOS Medicine, the study examined 102 different clinical trials in which participants followed different diets and had their blood glucose, insulin, and HbA1c (a measure of long-term blood glucose control) levels recorded. A total of 4,220 adults — some of whom had diabetes — and 239 different diet groups were included in the study. Within each of the clinical trials, participants in each diet group consumed the same number of calories, regardless of the other aspects of their diet. As noted in a HealthDay article on the study, the researchers found that some fats raised blood glucose levels less than others — and that substituting some fats for carbohydrates could also lead to better blood glucose control. When participants switched out 5% of the calories in their diet from carbohydrates to saturated fat, HbA1c levels barely changed — rising just 0.03% on average (not a statistically significant difference). But when the same 5% of calories were switched from carbohydrate to monounsaturated fat, HbA1c fell by an average of 0.09%. And it fell by 0.11% when carbohydrate was replaced by polyunsaturated fat. Since saturated fat seemed to have the least beneficial effect of blood glucose control, the researchers also looked at the effect of switching 5% of calories from saturated fat to either monounsaturated or polyunsaturated fat. Here the effects were even more dramatic. HbA1c fell by an average of 0.12% when saturated fat was replaced with monounsaturated fat, and it fell by 0.15% when saturated fat was replaced with polyunsaturated fat. Most food sources of fat contain a mix of saturated, monounsaturated, and polyunsaturated fat — but some contain much more of one type of fat than the others. Saturated fat is the main type of fat found in meat and poultry, dairy products, and certain plant oils (including coconut oil, palm oil, and cocoa butter). Monounsaturated fat is the main type of fat found in most nuts (including almonds, pecans, hazelnuts, cashews, macadamias, and peanuts), avocados, olive oil, canola oil, and peanut oil. Polyunsaturated fat is abundant in fatty fish (including salmon, herring, and mackerel), walnuts, sunflower and pumpkin seeds, corn oil, sunflower oil, safflower oil, and soybean oil. What’s your reaction to this study — have you noticed that certain fatty foods affect your blood glucose levels in a particular way? Have you tried substituting carbohydrate in your diet with fat, and if so, what effect did it have on your blood glucose? Are you interested in eating more foods with monounsaturated or polyunsaturated fats as a result of the study? Leave a comment below!